Sicker examines the fundamental norms of civic conduct considered essential to the emergence and moral viability of the "good society" envisioned in the source documents and traditions of Judaism. The principles underlying the desired behavioral norms constitute the ethical underpinnings of the unique civilization envisioned by Mosaic teaching, a Judaic civilization characterized by instituted norms of civil conduct deemed necessary to ensure appropriate civil relations between persons, individually and collectively. The tensions in Judaic thought regarding the concept of democracy as a paradigm for Judaic government are examined, including the theological as well as moral implications of democracy that cast doubt on its appropriateness as a political ideal. Sickers considers the role of popular consent as a legitimating factor in the Judaic polity, and the distinctively Judaic approach to the ordering of civil relations in society within the constitutional context of a nomocratic regime based on lhalakhah, Judaism's own dynamic system of canon law. Three fundamental societal issues are then explored. First, the status of the individual within the properly constituted society and the relationship of the citizen to the state. Included in this discussion is the question of the legitimacy of civil disobedience. Second, Sicker examines the practical implications for public policy of the Judaic imperatives regarding social justice and the idea of prescriptive equality. Finally, he takes a hard look at the classical Judaic approach to dealing with the problems of ensuring national security within the context of Judaic norms. 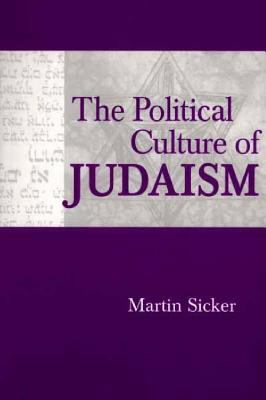 A groundbreaking text essential to students, scholars, and reseachers involved with Jewish thought and intellectual history and comparative political thought.Sicker, Martin is the author of 'Political Culture of Judaism' with ISBN 9780275974299 and ISBN 0275974294. Loading marketplace prices 88 copies from $5.94 How does the rental process work?